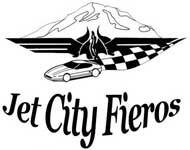 Over the past few years many Fiero owners from Arizona to Canada have attended the Northwest Fiero Festival. But how does the show come to be? It takes the efforts of many dedicated people to put on a show of this size. Planning for the Northwest Fiero Festival starts in January with a meeting of the Festival Planning Committee. During this meeting there are discussions about the previous years festival such as what we want to change or keep the same. Officers also volunteer for various responsibilities. In addition to the show officers, members of all 5 northwest Fiero clubs take on various tasks from gathering raffle prizes and trophy sponsors to transporting food to and from the event. Without everyone's help we would all be lost!